This deliciously different homemade ice cream recipe is sweetened by local wildflower honey and perfumed with a subtle hint of farm-fresh lavender. 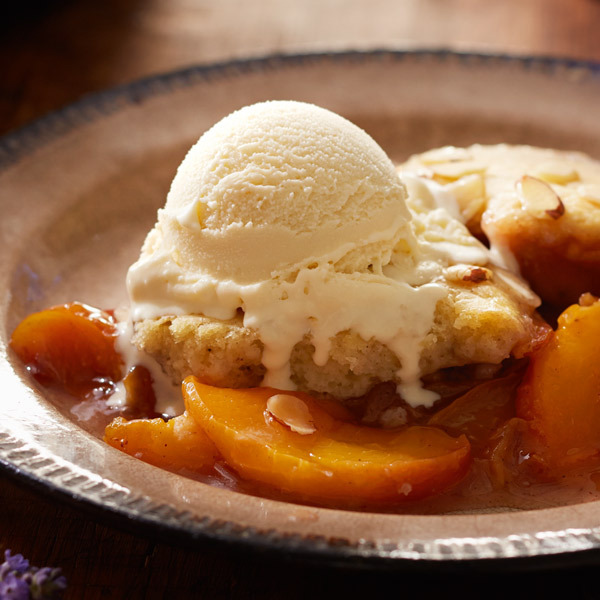 A scoop of this Honey-Lavender Ice Cream is simply heavenly on our warm Roasted Peach Skillet Cobbler or your favorite fall fruit crisp. In a medium saucepan, combine the milk, cream, lemon zest, lavender flowers and honey. Heat to a bare simmer over medium heat, stirring frequently. Remove from heat and cover. Set aside for 20 minutes. In a medium bowl, whisk the egg yolks. Slowly whisk the cream mixture into the yolks, and then pour everything back into the saucepan. Heat the mixture over medium heat, stirring constantly and scraping the bottom as you stir. Gently cook until the mixture thickens enough to coat the back of a wooden spoon, about 4 minutes. Pour the custard through a fine-mesh strainer into a clean container. Stir in the salt and vanilla extract. Place the container in an ice bath and stir occasionally until it is cool, about 20 minutes. Cover and refrigerate for at least 3 hours or overnight. Churn the ice cream according to the ice cream manufacturer’s instructions; transfer to a freezer-safe container and freeze until firm.